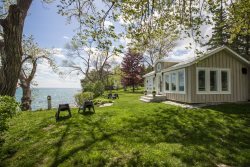 Renowned for its picturesque dunes and white sand beaches, Sandbanks Provincial Park is located on Lake Ontario 15 minutes by car south-west of Picton. Approximately 600,000 visitors come to Sandbanks annually to camp, hike or go to the beach. The most popular beaches are Outlet Beach (endless white sand and kid-friendly shallow water) and Dunes Beach (giant sand dunes, bay beach with gentle waters and playground). Sandbanks/Richardson's has also become popular with dog owners and families alike over the years. We have many homes within 10 minutes of the beach whether in East Lake, West Lake or on Sheba's Island.